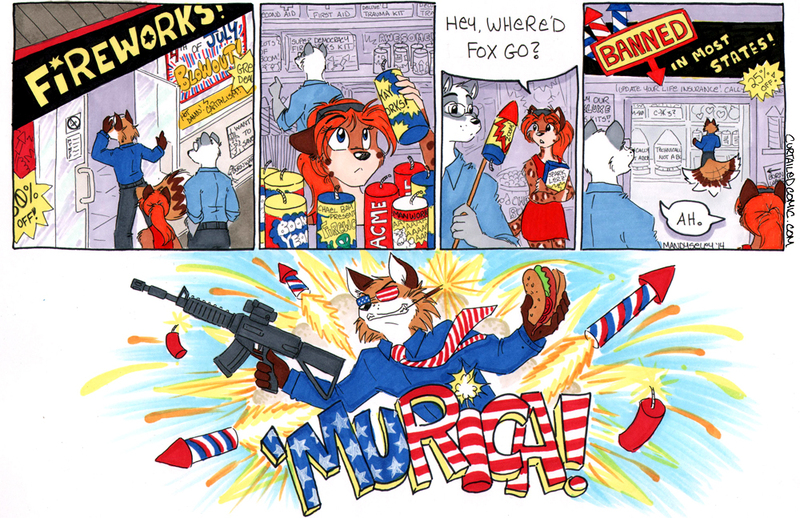 This was a lot of fun to draw… hope all our USA readers had a happy and safe Independence Day! This did happen, Mandy just wasn’t present. Yeah, the first place I went was a section actually called “Banned in most states”, for obvious reasons. I’m not sure what it was, but one big explosive I bought there that looked like an M80 was placed on a birthday cake as a candle as a joke. We lit it out in a field and let the birthday girl watch it from a distance. I was going to give her a slice of what was left, but the Boston Cream cake was simply vaporized. We found a small piece of the plate. Nothing else existed. The noise was unlike anything I’d ever heard before.